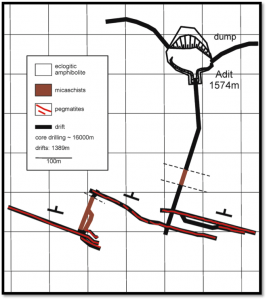 The resource declarations by previous owners included inferred resources from extrapolation of identified significant pegmatite veins at depth to RL1100m. JORC Code (2012) reporting standard requires that all resources declared follow sampling. A deep hole drilling programme (4 holes in total) was completed, results of the initial two holes confirming the extension of the pegmatite veins to depth. The resource at Wolfsberg Zone 1, comprising the previously declared Measured and Indicated resource and new Inferred resource are summarised below. *Measured and Indicated resource at a cut-off grade of 0% Li2O as the veins will be mined contact to contact. Zone 1 is the northern limb of an anticline. Surface boulder mapping and scout drilling in 2012 indicated that the lithium bearing pegmatite veins extended to the southern limb of the anticline known as Zone 2. A drilling programme commenced with 2 of 3 drill holes intersecting wide and high lithium grade pegmatite veins. This programme resumes in January 2018. 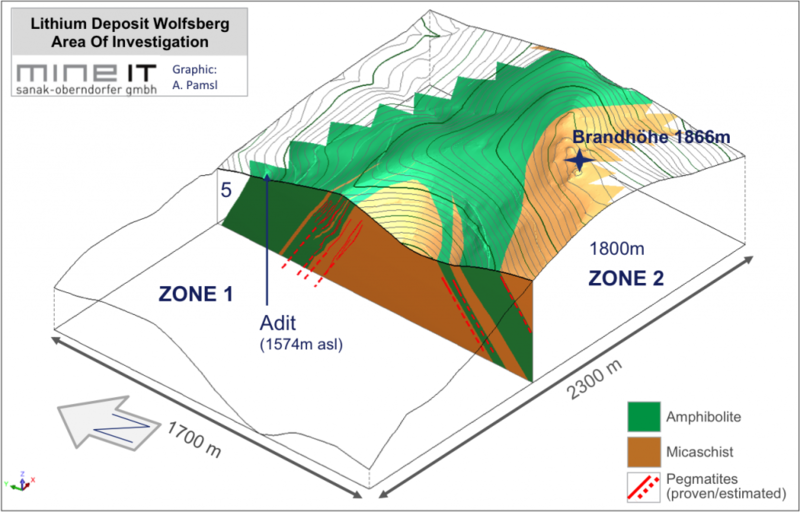 Following the acquisition of the Wolfsberg project, GSM undertook exploration drilling in 2012 on the southern limb of the anticline which confirmed the structural interpretation and presence of lithium bearing pegmatite veins. Mining was undertaken in 2013 to validate the mining license and to collect 500 tonne bulk samples from the two ore types for metallurgical testing. The Minerex drilling data was utilised to develop a three dimensional resource model for use in mine planning. the northern limb of an anticline was drilled by Minerex down dip to a maximum depth of 450m and mapped over a distance of 1500m. Lithium bearing pegmatite veins up to 5.5m wide intersected and ore body remains open along strike to the west and down dip. Minerex completed 16,727m of drilling and 1,389m of mine development including access decline, drives and crosscuts. exploration target, demonstrated to be the southern limb of an anticline of which the northern limb (Zone 1), was the focus of all exploration by Minerex. This area is believed to have the potential to mirror the resources of Zone 1. Minerex completed exploration work that comprised initial surface geology mapping along with 9,940m³of surface trenches and a diamond drilling programme totalling 12,012m collared from surface. 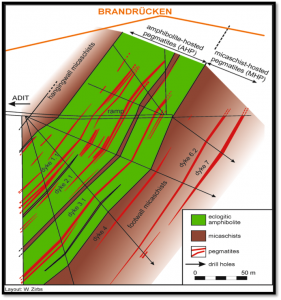 In 1985 an underground exploration programme was undertaken including development of a decline from the surface from the northern side of Brandrucken Mountain through the amphibole schist to provide access to the pegmatite veins. Crosscutting drifts were driven along strike of selected veins to provide access for mapping and sampling and an additional decline was driven to access the veins in the mica schist. In all 1,389m ofunderground development was mined. A diamond drilling campaign of 4,715m was undertaken from underground to effectively infill the surface drilling to about 50m intervals in the eastern part of Zone 1.
by Dr.Göd, Mineralium Deposita 24, 270-278 (1989). Company, prepared from Minerex data by Dr. Göd. Mineral processing studies were undertaken for Minerex by the North Carolina State University. As a result of the testwork, using flotation and magnetic separation, spodumene concentrate with Li2O grades greater than 6% could be produced with spodumene recoveries of over 85%. Furthermore, ceramic grade feldspar and glass grade quartz were also recoverable. Mica concentrates were also considered a possible by-product. A pilot plant was set up which demonstrated that of all the mined and processed ore 74% was a saleable product. Since this work in the mid 1980’s there have been numerous advances in metallurgical technologies. Dorfner Anzaplan, Germany, were engaged to carry out metallurgical optimisation testwork. As the pegmatite veins at Wolfsberg are fairly narrow it can be expected that mining dilution could be significant. However, test work into laser sensor sorting has shown that in the treated size range +8 – 70mm, mining waste dilution can be effectively rejected maximising grade to the processing plant. 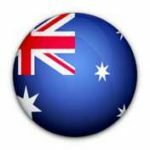 The test work has confirmed that a flotation spodumene concentrate of 6% Li2O can readily be produced for sale or conversion to battery grade lithium carbonate and hydroxide. By products of feldspar and quartz were also produced which are suitable for ceramic and glass use in local industry. Test work on spodumene conversion using the commercially proven acid roast process demonstrated that battery grade lithium carbonate and lithium hydroxide can be readily produced from Wolfsberg spodumene concentrate. The Minerex study in the 1980’s concluded that open stoping and cut and fill were suitable mining methods and trial mining was undertaken. SRK Consultants were engaged to develop a conceptual mine plan for the declared resource with consideration given to how resource upgrades would impact the mine plan. This scoping level study concluded that long hole open stoping is the preferred mining method. Utilising only the measured and indicated resource leads to a mining rate of about 600,000tpa which after ore sorting to reject waste results in about 400,000tpa feed to the concentrator and production of just over 50,000tpa spodumene concentrate which converts to just over 7,000tpa lithium carbonate for a 13 year mine life. Preliminary economics indicated a production cost of US$5,000/tonne lithium carbonate. 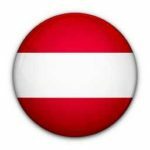 The study also indicated that the probable maximum mining rate was about 800,000tpa which would result in lithium carbonate production of 11,000tpa in full production years. However, increased resources are required to support increased production rates. The project area is located in a commercial forest. The mining licence requires the submission of an operating plan to the Mining Authority before mining activities commence. This plan must also address environmental management. An environmental consultant, Umwelt Büro, is currently carrying out baseline studies. The Company has commenced a pre-feasibility study to determine the optimum production configuration and capacity, location for the processing facilities, as well as provide estimates for capital requirements, operating costs and the economic performance of the project. DRA Global has been engaged as lead consultant for the PFS with SRK Consulting undertaking the mine design and Paterson & Cooke the tailings disposal design. Completion of the PFS is scheduled by end Q1 2018.